Welcome to our farm website we invite you to take a look around and get to know us. We try very hard to create a family atmosphere at our facility; every one of our riders is near and dear to us. We have so much to offer at our facility. 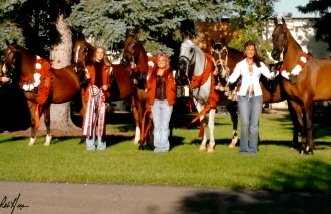 Our horses are some of the highest achieving in the nation. Our riders and handlers have numerous local, regional, and national wins. We are very proud of our achievements but also recognize the amount of work required to achieve such high status. Our riders and handlers take lessons regularly and practice year round. A firm foundation of training is of utmost importance for success. Yet above all else is the fun of the sport, we loose so much when we focus only on the titles. Far too often we forget to glance back and see how far we have come. Reflecting on each success produces the fun memories surrounding the event, rarely is it the title that means anything, it is the path to the roses that is the most fun and memorable. Our goal is to allow you to reach your full potential and achieve the impossible, beyond your wildest dreams. We love working with youth and amateur riders and welcome all riders of any experience level. Thank you for visiting our site. When its time to hit the ring, get ready for our well oiled assembly line. Our riders roll through makeup and hair detail, into the dressing room, and out for a final spit shine before it’s time to mount. Meanwhile your horse is being braided, bowed, brushed, polished, and tacked up. Out of the assembly line comes a beautiful pair of horse and rider ready for the ring You then head up to the “boss” and she will get you warmed up and tuned up for the ring. You will never be alone, a trusty group of willing grooms trails behind, carrying anything and everything you may need, including an encouraging word!! As you go in the ring you will always have a great cheering crowd rooting for you. No matter what you will never take a long walk alone, win or loose we will all be there. When your ride is done, congratulatory cheers and hugs are complete, a pit crew disassembles your horse as you take your show gear off. Another successful day for our team. We are all there for each other, true teamwork at its best. The teamwork and camaraderie doesn’t stop at the shows. At home we have fun days that our youth riders get together and enjoy their horses. The best way to learn is by hands on experience, and we try to provide a safe learning environment for our riders to progress. We take great pride in our facility, this is your horse’s home and ours as well so neatness, cleanliness, and safety are of utmost concern. 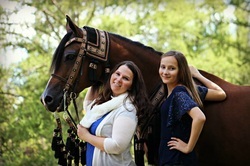 The health and happiness of our clients’ horses are the basis of our entire program. Turnout time, regular exercise, and a well balanced diet are essential for any equine athlete and we try our best to provide this. Take a look around at our facility, our training, lessons, and boarding to see what we offer.